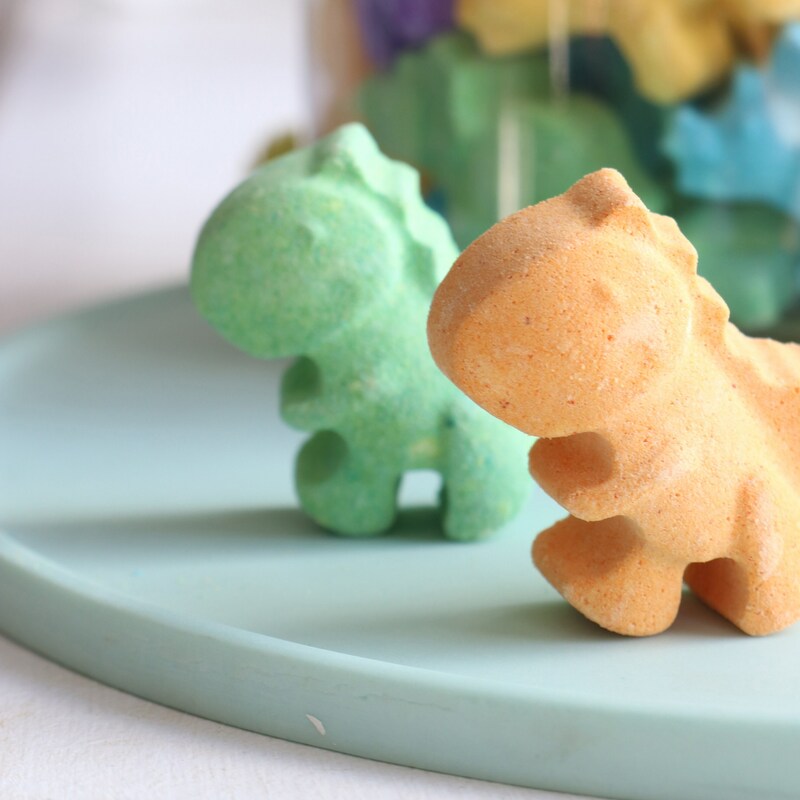 Little Bath Bomb Dinosaurs to create a Jurassic amount of fun in the tub - they're roarsome! 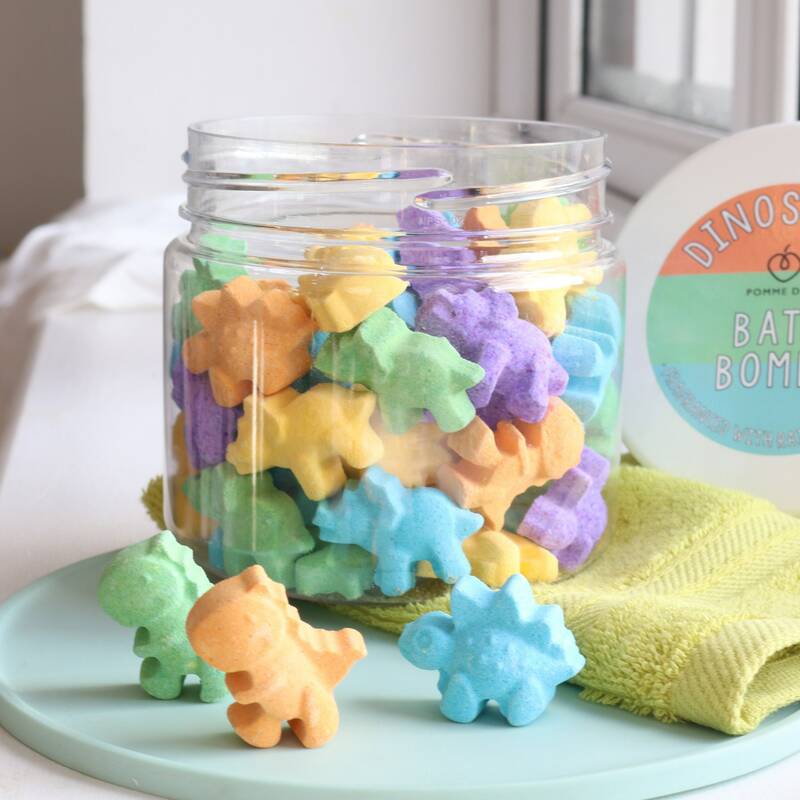 Cute bath bomb dinosaurs in pastel shades of yellow, green, purple, orange and blue. 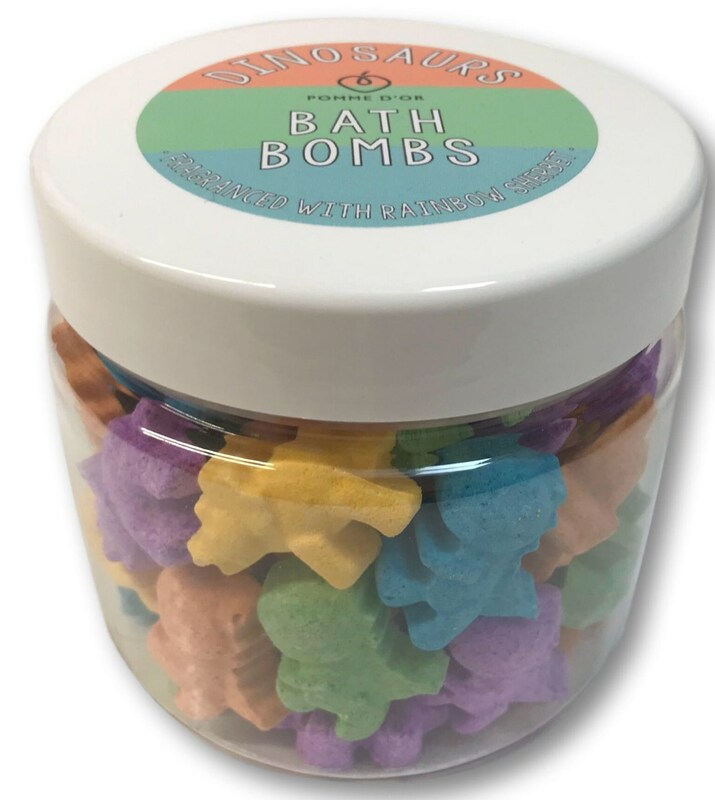 With a Rainbow Sherbet fragrance, they’ll make your bath smell like a fizzy fruit salad, with notes of ripe cherries, zesty lime, tropical pineapple, and hints of sweet vanilla. Many skincare products use fragrances containing allergens which can potentially cause allergic reactions, especially on young and sensitive skin. 'Rainbow Sherbet' frgrance oil is 100% allergen-free* making it less likely to cause skin irritation. Products are handmade in Devon by Anne-Marie of Pomme d’Or, who holds an Advanced Diploma in Skincare Product Design. 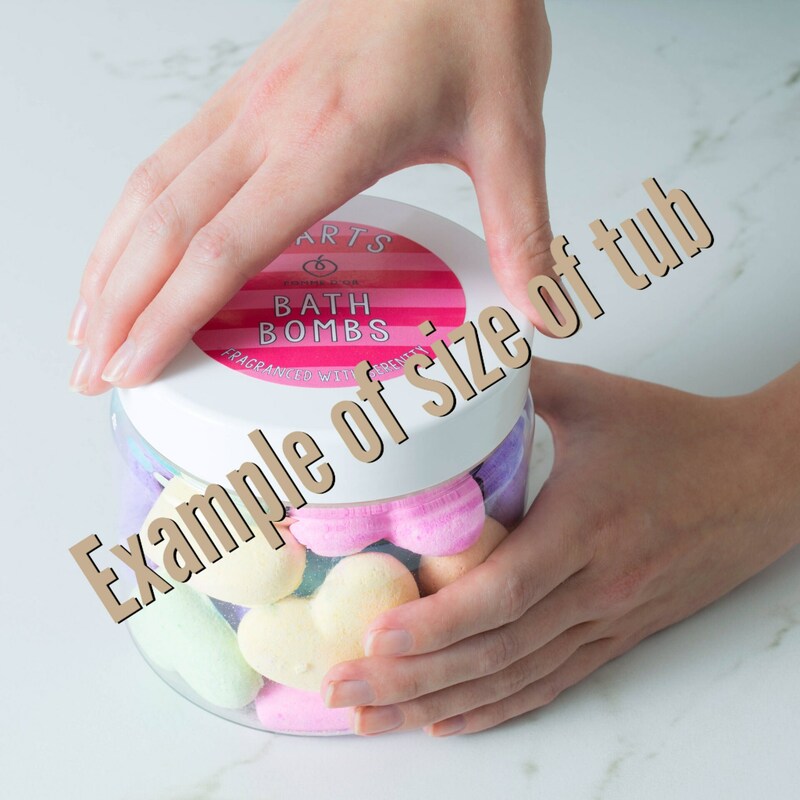 Bath bombs are made in small batches to ensure that they are fresh, which gives them a 12-month shelf life. Products are not tested on animals. This is a vegan-friendly product. 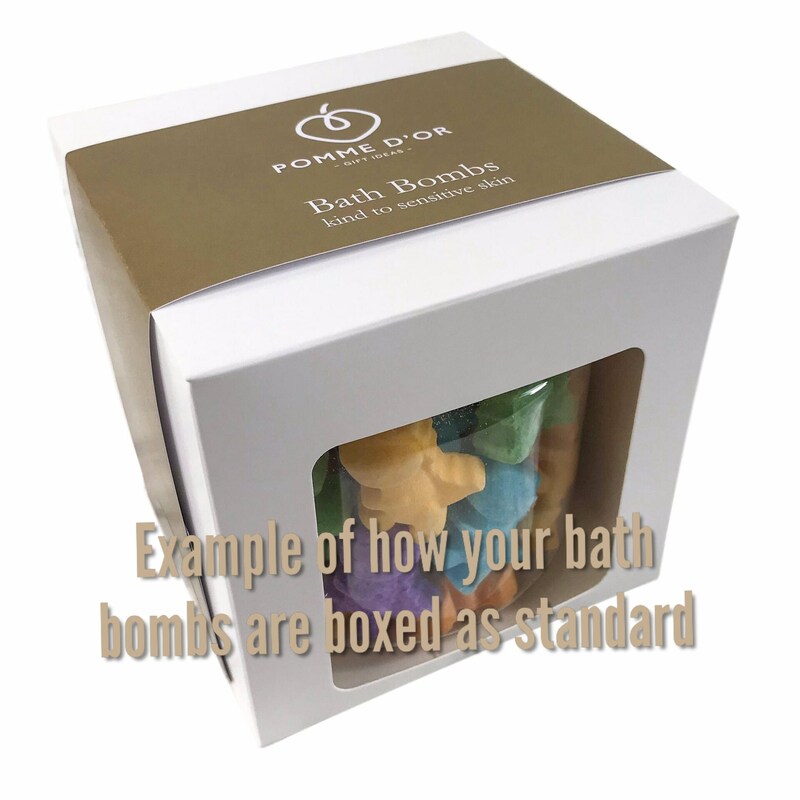 They are suitable for use by age 3+ making them a great gift for children to add some fun to bath time. The white box packaging comes free of charge, ready for gifting. If you’d like to add gift wrapping to your order for a small extra charge, your bath bomb box will be wrapped in gold wrapping paper finished with a flourish of pale yellow ribbon (see photo example). Sending direct to the recipient? Then why not add a personalised gift tag using the drop-down menu when ordering. Are you interested in a bespoke order for party bags? Then there's no need to pay for packaging which would just be discarded - drop me a note to discuss options. Definition of Allergen-free: This is a fragrance which, to the very best of the fragrance manufacturers knowledge, does not contain any of the 26 potential allergens, as outlined in EU Directives. Note: Colours may vary slightly from batch to batch. Sodium Bicarbonate, Citric Acid, Fragrance, Hamamelis Virginiana (Witch Hazel) Distillate, colouring: CI19140, CI45350, CI42090, CI16035, CI45100, CI14720, CI60730, CI40215, CI74180. Pomme d'Or (golden apple) - beautiful to the core.